The Ntini name has transcended generations, as Thando steps out of his father’s shadow and becomes his own man. It’s been five long years since we saw the legendary name on a team sheet, as Makhaya Ntini played his final cricket match in his home province for the Warriors in 2012. But as he closed the door on a phenomenal playing career and the fans said farewell to Border’s favourite son, the era of Thando Ntini was just beginning. Thando was starting to make inroads as a young prospect for Border U13. Despite growing up in the sport from a young age because of his dad’s legendary status, there was a hunger and a desire to play, which was starting to blossom on its own. When asked what the most memorable moment of his father’s career for him was, Thando replied ‘his 10-for at Lord’s’, and with the humiliation that the Proteas experienced at the Home of Cricket in the first Test last week, South Africa could have used the fiery Ntini spirit to take a couple of wickets in England’s crucial first innings. In between his father’s travelling with the national and domestic side, Makhaya admitted that his son’s best quality is his ‘strong mind’ and this was proven when he took initiative as a 16-year-old to move to Cape Town in the 2017 academic new year. Speaking exclusively to SACricketmag.com, Thando revealed what makes him a future prospect. If you watch Thando bowl, it’s quickly noticeable that his bowling action is very similar to his father, but that is the only similarity as the 17-year-old thrives to become a serious all-rounder. 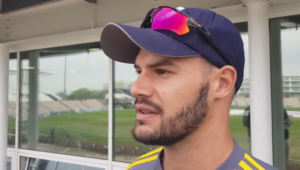 ‘I’ve been working hard on my batting with the coaching staff at Newlands and it’s paid off. ‘I went to Colts Academy Week with WP and I batted at No 5. It was a completely different league and it’s a higher level than school cricket because I faced cricketers who play semi-pro and franchise cricket. Ntini made the difficult decision to leave Selborne College and has moved to one of South Africa’s most prestigious cricketing schools, Wynberg Boys’ High. ‘Wynberg has improved me as a cricketer because our net sessions are much longer than at Selborne College,’ he said when asked about his new school. This decision means that he’ll now be plying his trade for Western Province, in a city he now calls home. ‘Cape Town is good. It took some time to adjust, but I’m settling in well; it feels like home,’ said Ntini. He also said that the coaching staff at Newlands aided his transition as a Western Province player by helping him improve his development. In his first official ODI for SA U19, he picked up 4-56 to help the side claim a five-wicket victory. ‘It was really special,’ said Thando about his debut. ‘I told myself “approach it like it’s a school game, do what you normally do, no pressure”. He also mentioned the advice he received from his father and SA U19 coach Lawrence Mahatlane. ‘I received a lot of information from coach Lawrence and his coaching staff, who told me to stick to the basics,’ he said. ‘My dad advised me to relax and do what I normally do. He told me “enjoy it; it’s the same game, same cricket ball It’s just a different colour kit”. Ntini aims to comprise an all-rounder role in the future and is confident that he will achieve this goal. He is currently part of the SA U19 squad who are playing in a five-match ODI series against West Indies. Perhaps one day we’ll see another Ntini scratch his name on to the Lord’s honours board.